Free Shipping Included! [NEW UPGRADED] Mefru Ultrasonic Pest Repeller-Electronic Pest Control-Plug in Home Outdoor and Indoor Repeller - Get Rid of Insects, Rodents, Mice, Mosquitoes, Cockroaches, Spiders, Flies, Ants. by Mefru at The Mirror Project. Hurry! Limited time offer. Offer valid only while supplies last. Mefru Ultrasonic Pest Repeller Feature: ●Eco-friendly pest control solution. ●Safe for kids, pregneant and pets. ●Easy to use pest repellers. ●Safe for kids, pregneant and pets. ●Easy to use pest repellers. ●Without harsh chemicals, nasty traps or unsafe fumes. ●Product is organic and odorless. ●The product is also eco-friendly thus protecting the health of both the user and his surroundings. ● Mefru Ultrasonic Pest Repeller is a product that has been invented by professionals to meet the ever-changing needs of the customer. - One unit only for one room as you can see ultrasonic waves can't travel through walls. - To make the best of the ultrasonic pest repeller, it is recommended to avoid carpet, curtains and those sound-attaching material around the device. - Ultrasonic Pest Repeller should be installed at least 20~150cm vertically above the floor and plugged to the outlet. - You may see increase of insects at initial use, as they coming out their homes and trying to leave the area. ✔️ The Upgrade Ultrasonic Repeller is eco-friendly: safe for pets and human when utilized as the Mefru product tends to have no toxic agents, inaudible ultrasonic sound, odorless and thus making the Repeller to be safe in an environment where there is the presence of children. ✔️Upgraded Version Microchip: Mefru ultrasonic pest repeller has an inbuilt the most advanced chip to promote the ultrasound, and it continually auto-varies frequency ranging between 25-65 KHz that tend to destroy the nervous system of pests as the pests are not immune to the ultra-sound. ✔️Most effective ultrasonic technology: Mefru Repeller has been integrated with a useful ultrasonic technology which enables the product to wipe out the pets. 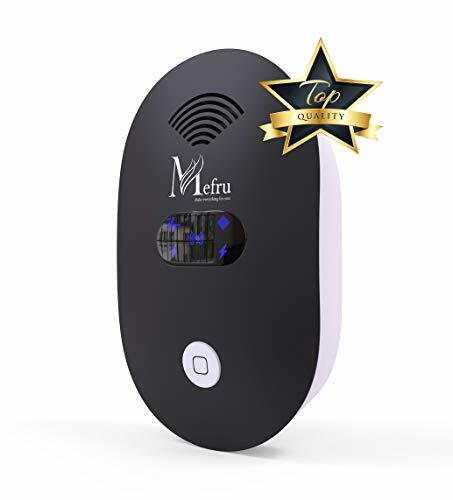 ✔️Global Usage Tool: Mefru Ultrasonic Pest Repeller acts as a worldwide tool as it can be used in environments such as hotels, offices, houses, attics, basement, garage, and stores. Mefru Ultrasonic Pest Repeller tends to cover a wide area when applied by users. If you have any questions about this product by Mefru, contact us by completing and submitting the form below. If you are looking for a specif part number, please include it with your message.